Congratulations to Emma and Stewart Tanner for successfully completing their PADI Scuba Review with 2DiVE4 this month. Well done guys! 2DiVE4 schedules regular 2DiVE4 Dive Club Weekends at the beginning of every month. 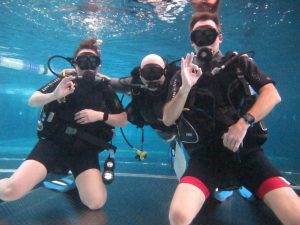 On these weekends you can join us for some pleasure diving, or if you want to progress with your diver training education then 2DiVE4 can conduct the PADI Rescue Diver Course. We have this course structured in May 2019. You may also wish to join us on our 2DiVE4 Seal Diving Trips or one our 2DiVE4 overseas holidays like our 2DiVE4 Cozumel 5 Star Diving Holiday or our amazing 2DiVE4 GALAPAGOS Dive Holiday in 2020 to dive with schooling hammerheads, whale sharks, sea lions, marine iguannas and much more!